A small storage medium used to store data such as text, pictures, audio, and video, for use on small, portable or remote computing devices. Most of the products use flash memory, although other technologies have been developed. There are a number of memory cards on the market, including the SD card (secure digital card), the CF card (CompactFlash card), the SmartMedia card, the Memory Stick, and the MultiMediaCard (MMC). These cards are of varying sizes, and each is available in a range of storage capacities. Most cards have constantly powered nonvolatile memory, which means that data is stable on the card, is not threatened by a loss of power source, and does not need to be periodically refreshed. Because memory cards are solid state media, they have no moving parts, and therefore, are unlikely to suffer mechanical difficulties. Earlier removable storage media, such as the PC card, the smart card, and similar cards used for game systems, can also be considered to be memory cards. However, newer cards are smaller, require less power, have higher storage capacity, and are portable among a greater number of devices. Because of these features, memory cards are influencing the production of an increasing number of small, lightweight and low-power devices. Memory cards offer a number of advantages over the hard disk drive: they're smaller, lighter, extremely portable, completely silent, allow more immediate access, and are less prone to mechanical damage. 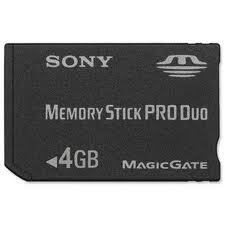 The most popular flash memory cards are for digital cameras and other mobile storage. Introduced in 1999 by Panasonic, Toshiba and SanDisk, cards up to 128GB are available with huge capacities planned for the future (see SDXC below). SD Cards use the same 32x24mm form factor as the earlier MultiMediaCard (MMC), but are slightly thicker (2.1mm vs. 1.4mm), and SD Card readers accept both formats. Fast Storage - Although SD Cards support encryption and content protection (the "Secure" in SD), they have been mostly used for regular storage due to their small size and fast transfer rate, which started out at 10 MB/sec and has steadily increased. SD uses NAND flash technology (see flash memory). Smaller: miniSD & microSD - Introduced in 2003 and 2005 respectively, the small-footprint miniSD and microSD formats are electrically and software compatible with the regular SD Card. They can also plug into full-size SD slots via adapters (see microSD). SD High Capacity (SDHC) - Based on the SD Card Association 2.0 specification, SDHC cards do not work in SD devices, because SD uses the FAT16 file system, and SDHC uses FAT32. However, SDHC devices support both SDHC and SD Cards. SDHC also comes in miniSDHC and microSDHC formats. See Video HD. SD Extended Capacity (SDXC) - Introduced in 2009, and available up to 128GB, SDXC cards raise the future maximum capacity to two terabytes (2TB) by using the exFAT file system. SDXC cards are compatibile with SDHC. A microSDXC format is also available. See Eye-Fi, gruvi card, SDIO card and MultiMediaCard. UHS-I and UHS-II - In 2010, the Ultra High Speed (UHS-I) interface was introduced for SDHC and SDXC cards at 104 Mbytes/sec. In 2011, UHS-II tripled the rate to 312 MB/sec to support reading and writing high-resolution 3D HD content.